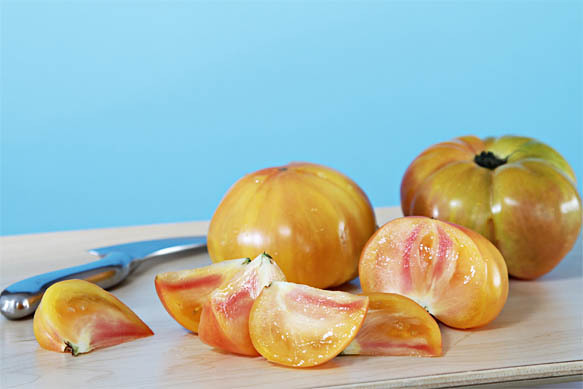 Yellow heirloom tomatoes -- like the Golden Jubilee, Amana Orange, Yellow Brandywine or Bicolor Mortgage Lifter -- are slightly sweet, juicy and fleshy. They also have very few seeds, making them perfect candidates for gazpacho. 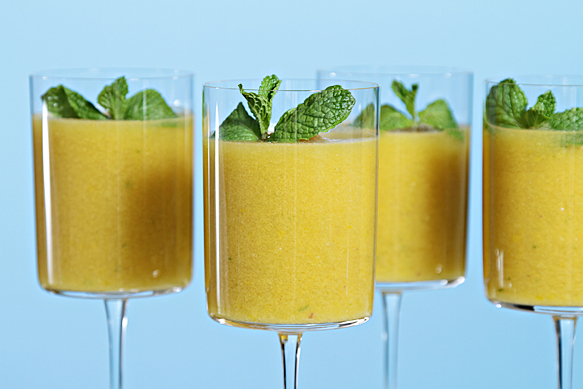 If you want to dazzle dinner guests, serve this gazpacho in wine or cocktail glasses as shown. But this chilled soup is also perfect for a casual summer barbeque. Place it in a large bowl on ice and let your guests pour it in small cups or tumblers - refreshing and light... and they won't spoil anyone's appetite. Step 1: Place all ingredients, including the reserved tomato juices in the bowl of a food processor. Pulse at high speed with a steel blade until all ingredients are finely chopped, then process until soup is very smooth, about 2 to 3 minutes. Step 2: Transfer to a large bowl and refrigerate 2 hours or overnight, until well chilled. Step 3: Place the soup in the freezer for 30 minutes before serving so it is very chilled. Ladle the soup in bowls or cocktail glasses. Place a spoonful of the lime-infused oil in the center. Garnish with the fresh mint and serve.